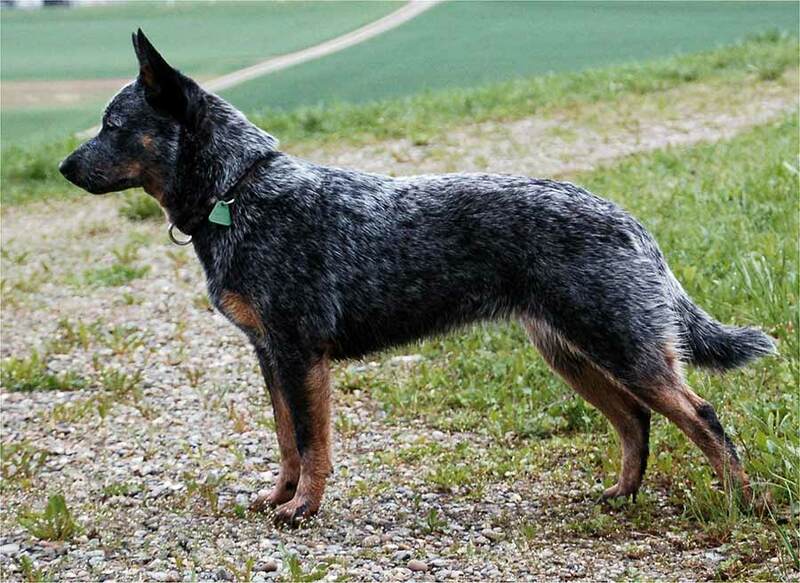 Australian Cattle Dog (ACD) was developed in Australia in response to the growing beef industry. The herding dogs available were unable to manage the herds of wild cattle. The breed was derived from crossing the native dingo (a silent hunter with incredible stamina) with a Dalmatian (for horse sense), Highland Collies (for herding ability), and the Black and Tan Kelpie (a herding breed). The Australian Cattle Dog breed has been called a blue heeler, red heeler, and Queensland heeler. Australian Cattle Dogs are compact and powerful. They stand between 17 and 20 inches tall and weigh between 35 and 50 pounds. The eyes are oval and alert, ears are upright, and the tail reaches the hocks with a slight curve. The Australian Cattle Dog coat has a dense undercoat and a close outer coat no longer than a 1.5 inches. Colors include red speckle, blue, blue speckle, and blue mottle. Twice weekly brushing will keep the Australian Cattle Dog in nice shape, except during shedding season (spring and fall) when daily brushing is needed. The Australian Cattle Dog needs vigorous daily exercise. Although long brisk walks will be appreciated, that is not enough exercise for this breed. The Australian Cattle Dog will also need to go for a run alongside a bicycle, do herding training, run the agility course, or play a fast game of flying disc. Without enough exercise, the Australian Cattle Dog will become bored and develop bad habits. The breed excels at many canine sports and should participate in at least one. Early socialization and training are also needed, as this breed is very bright and able to think for himself. Training can teach good habits and household rules and can motivate the dog to want to be good. Without mental stimulation, as well as exercise, the Australian Cattle Dog will get into trouble. This can be a difficult breed for a first-time dog owner. He can be wary of strangers but is affectionate with his people. He’s good with kids but will try to herd them, often nipping at heels. Health concerns include hip and elbow dysplasia and deafness. Share your Australian Cattle Dog story. Note: Upload only Australian Cattle Dog picture or your picture with Australian Cattle Dog below - spammer's ip may be blocked. Bold and athletic, the robust Australian Cattle Dog enjoys romping and roughhousing. He is absolutely NOT an apartment dog. To stay in hard muscular condition and a satisfied frame of mind, Australian Cattle Dogs (also known as Queensland Heelers) require lots of exercise. Working livestock, agility, jogging, biking, chasing balls, and playing Frisbee are productive outlets for this breed’s high energy. Cooping him up with nothing to do will lead to destructive behaviors and obsessive barking. With strangers, the Cattle Dog is watchful and often suspicious. Early socialization is important so that he does not become too sharp. He can be dominant and pushy with other dogs, and with his strong chasing drives and tendency to nip at whatever he is pursuing, he is not recommended around cats unless raised with them. A challenging combination of cleverness and hard-headedness, Australian Cattle Dogs will test members of the family during adolescence and must be handled with firm, consistent leadership. These versatile dogs can learn and do a great deal in the right hands, but they will run right over hapless owners.